It’s important to maintain your building’s fire extinguishers. They need to be serviced yearly by a company qualified to do so. In addition to this, you also need to do monthly fire extinguisher inspections. This is required by OSHA but is also a good practice. This way, you have a reasonable assurance that your fire extinguishers are in working order in case of a fire. You should determine who will be responsible for doing the monthly checks. It tends to be easiest this way so that person is held accountable and gets used to it being their responsibility. IC Fire can provide this service upon for you. We carry all the necessary supplies required to maintain 4 year records even for extinguishers exsposed to the most extreme environments such as vinyl annual service tags, plastic & metal 4 year inspection tags and extinguisher covers. To do the monthly inspections youself, you should bring a pen and rag with you. As you approach the fire extinguisher, your first check will be to see if it is readily available, not blocked by any objects or difficult to get to in any way. It should be mounted and there should be a sign above it that shows there is a fire extinguisher in that location. If anything is blocking access to the fire extinguisher, now is the time to resolve it. Your next check will be to pick the fire extinguisher up. If it is a powder type of fire extinguisher, you should give it a shake or two. This prevents the powder from settling. As you have it in your hands, your third check is to ensure it doesn’t feel lighter than usual or lighter than others of the same size. If anything feels funny, give the servicing company a call to have them check it out. It’s better to be safe than sorry. The fourth check is to turn the fire extinguisher around in your hands, checking all angles and portions for dents, rust, oil, etc. If there is oil or any substance on it, wipe it off with your damp rag. If there is rust or severe abuse, replace it as soon as possible. Now place the fire extinguisher back where it was mounted. Check to make sure the instructions on it are legible and the label is facing outward. If the label is missing, see about getting a new label or perhaps a whole new fire extinguisher. Once it’s mounted back and the label is facing outward, check the pin or safety seal to ensure it is still intact. If it is not intact, you may have to replace the extinguisher. You’re almost done with your monthly fire extinguisher inspection! Now, check the gauge to see if it is still in the ‘green’ zone. 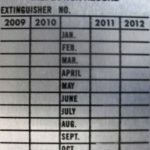 If it isn’t call the number on the yearly inspection tag to have the fire extinguisher serviced immediately. Finally, make sure the yearly service has been done within the last year. 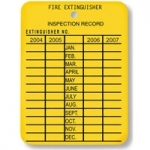 The tag usually has a month and year that have been marked off or hole-punched. Most servicing companies mark the year and month that the check was PERFORMED, not when it is due again. Check with your servicing company to ensure this is how they do it so you know what you’re looking at. Of course, if it has been over a year since it was serviced, call and schedule it for as soon as possible. Your check is all done. Sign your initials and date on the side of the tag that has spaces for monthly inspections. This shows others it is up to date and also proves to OSHA (or MSHA) that your monthly inspections have been done.